If it’s a replacement Roller Bearing, Split Bushing, Spindle Bearing, or maybe a replacement Bearing Race or Flange Bushing that will get the job done, shop at Jacks! 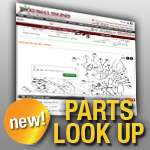 We have replacement lawn mower bearings and bushings for your John Deere, Toro, Cub Cadet, and many other manufacturers. If you know what you need, search by manufacturer below to get started on replacing those faulty lawn mower bushings and bearings. Jacks has great prices and fast shipping, we’ll get you what you need quickly!